Grab your camera, pack a picnic, and hit the road! 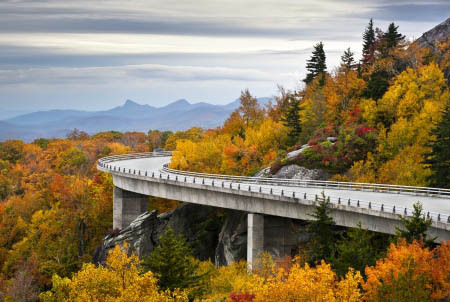 The North Carolina Mountains offer endless scenic drives through breathtaking national parks and forests in western NC. Highly recommended scenic drives are the Blue Ridge Parkway and Forest Heritage National Scenic Byway. The Blue Ridge Parkway is a 469 mile recreational motor road following the ridge of the Blue Ridge Mountains which connects the Shenandoah and Great Smoky Mountains National Parks. It offers some of the best mountain views in North Carolina. The Forest Heritage National Scenic Byway is a 79 mile route that includes spectacular views of waterfalls, picnic spots, and hiking trails. Explore the tranquil Pisgah National Forest during your drive. Be sure to stop at iconic places like Sliding Rock, Looking Glass Falls, and Looking Glass Mountain along the way. If you love the outdoors, western North Carolina is the place for you. Near Ashville, NC alone there are 3,000+ miles of free public hiking trails to explore. So grab your hiking shoes and discover the hidden gems of Pisgah National Forest, Nantahala National Forest, Great Smoky Mountains National Park, and trails along the Blue Ridge Parkway. Hiking levels range from beginner to expert, so be sure to select a hike that is suitable for you. For example you can set out on a 3-Mile waterfall hike in DuPont State Recreational Forest, climb the 6000ft summit of Black Balsam Knob, or explore the interesting geological features on the Alum Cave Trial. Nestled at the base of North Carolina’s Blue Ridge Mountains, the Biltmore Estate is the largest privately owned home in America. Built by George Washington Vanderbilt, the estate is a 178,926 square feet mansion on 8,000 beautifully landscaped acres. Completed in 1895, the Biltmore Estate features an impressive 250 rooms- all with awe-inspiring architectural designs. Step back in history as you get a close look at original art by renowned artists like John Singer Sargent, enjoy the intricacy of 16th century tapestries, and more. Prepare to spend a full day as you not only take in the French Renaissance architecture of the mansion, but stroll through beautiful gardens designed by famous landscape architect, Frederick Law Olmsted, and enjoy a wine tour. Western North Carolina is home to some of the best fly fishing on the east coast with over 3,000 miles of trout streams open to fishing. Jackson County’s “Western North Carolina Fly Fishing Trail” is the first fly fishing trail in the U.S. The trail takes you to 15 spots, featuring some of the best trout waters in the Great Smoky Mountains. Step Outside Your Comfort Zone with Adventure Activities in N.C. The mountains of North Carolina host a variety of activities for the adventure seekers. Enjoy whitewater rafting on the Watauga or French Broad Rivers, explore mountain trails on horseback, zip line down the side of a mountain, or try your hand at paragliding! See what goes on behind the scenes in Ashville, a town titled “Beer City USA” by booking an Asheville Brewery Tour. If wine is more your style, be sure to sample from 15 area wineries in the North Carolina mountains. Take a trip to Green Creek Wine Country or drive through the Catawba Valley Wine Trail for a fun filled afternoon. Be sure to taste some of North Carolina’s finest spirits before you go at Piedmont Distillers, Muddy River Distillery, or the Blue Ridge Distilling Company. If this list looks like too much to tackle in one vacation that is because it is! Many people have fallen in love with the western North Carolina Mountains and made the decision to move or retire here to make this region their home. Fall in love your own North Carolina Mountain property today!